This page provides you with Photographer resume samples that you can use for inspiration in writing your own resume, or for creating one through our easy-to-use resume builder. Below you'll find our how-to section that will guide you through each section of a Photographer resume. Freelance photography can be a fierce marketplace for any new or expert in this field. Great freelance photographers have many areas to work in and it’s quite exciting to say the least. However, whether you plan to work with a small photography agency or for yourself, you absolutely need a fantastic resume that stand out among the crowd. 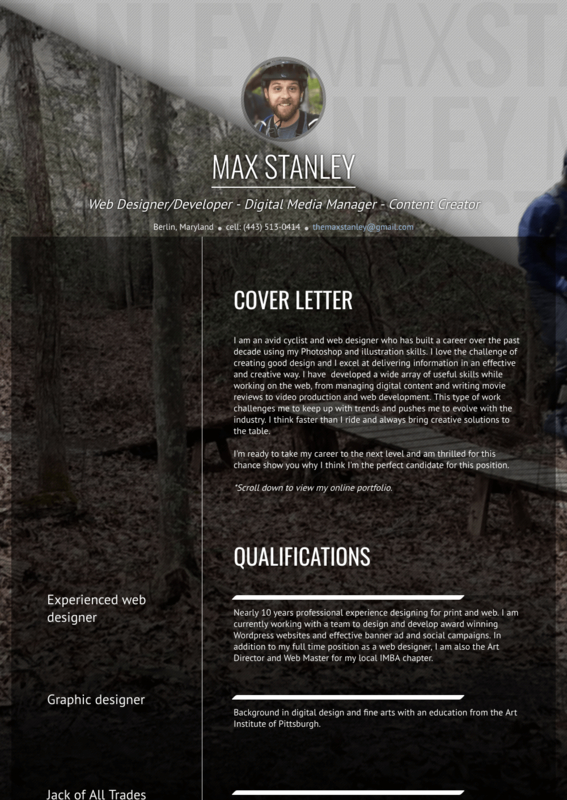 If you were searching through the web for the best freelance photographer resume sample, look no further...we’ve got it! Photography isn't just about snapping pictures from place to place. It's about impact. That impact is going to be from the moment your resume gets to the desk of the recruiter, and that’s when any prospective client will want to know more about you as a photographer. What we can do is to help you expand and improve upon your resume whether it needs a slight brush-up or a complete overhaul. Let us inspire you, we can help you get the gigs you have always dreamt of! Photographers have to have the crucial experience in order to be considered for certain roles. It’s important to have experience with photography in general but also editing and even know how to use photo editing software and programs. Despite what others might believe, photography isn’t just about taking a photo, it’s about editing too. Most employers look at a photographer’s background in the industry as much as their use in photo editing software and programming. In your resume you are going to have to be able to demonstrate your abilities in all areas so that recruiters can find your resumes appealing and attractive to read. What training do you have in photography? Do you have a good work history behind you? These are the things recruiters look for and when crafting your resume, you need to ensure it’s formatted in a manner that’s easy to grasp. You need to ensure the latest jobs or experiences you have in photography are listed first so that they grab the attention of the reader. Last but not least, please remember to save your resume as a .pdf file. Make sure you never forget the summary. It is an important section that contains every important detail of your résumé. If you are a photographer who has taken some reputable shots, this may be the place to state it. Apply your creativity to this section. Never forget to include the special skills that make you a very good photographer. Sell yourself to your recruiters as the best photographer available to them. To make your summary section interesting, describe the special kind of photography you are involved in and the special skills that make you a fit for their position. This is a quite simple but technical part of the résumé to compile. If you are applying to be a novice freelance photographer, working experience may not be needed. However, if you apply for something more serious, working experience is very vital. As a photographer, competence is a vital thing. The only thing that displays your competence is your previous working experience. No experience is a waste and anything related to photography should be stated clearly. If you have been involved in certain shoots, you can provide a link of these shoots to your employers. If you are still confused about work experience, we can help you. For more tips on writing the best work experience section for a great freelance photographer like you, check out our detailed resume guide. As soon as you have handled all the basic information about your education, you can then include anything extra. Do not forget to include all the certifications gotten from photographic conferences over the last 3-5 years. If you aren’t sure about adding a cover letter, why not think about how useful it can be to your resume overall? Follow our tips here. Have a link to your online portfolio: this is a must! Use an email address which is fake or has rude words in. Pretend your skills are better than they are – you’ll get caught out. Repeat yourself or copy other people's resume. If having access to a standout freelance photographer resume sample is not enough for you, why won’t you check our best freelance photographer resume templates? Our masterpiece has been used by many professionals like you around the world!